It’s been a bleak old week in my world but the black cloud that has been stationed above my head, much like the volcanic ash cloud which is lurking over Britain, has finally started drifting away. I’m a simple soul and in most cases like this a good coffee, cake, yummy meal or in this particular case, a trip to a fantastic cafe is the answer! Just over a month ago I was doing a recce of Kaffeine with a friend and we got chatting to a guy on the neighbouring table, who wondered why I was taking photos of my coffee. 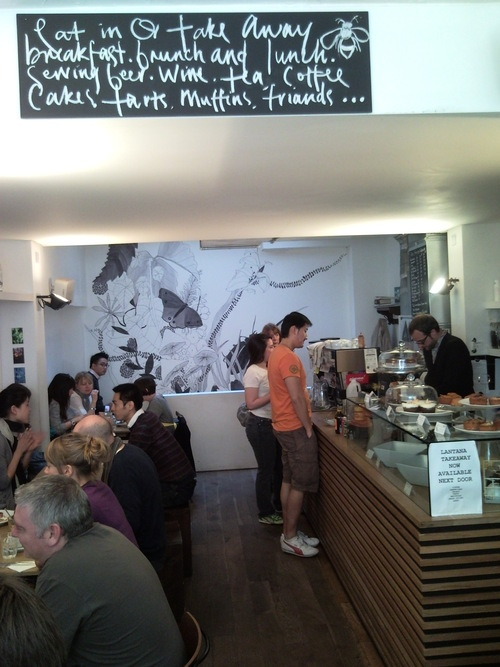 He enthused about a little cafe in Charlotte Place called Lantana and told me that the owner had started a blog about her experience of starting her cafe from scratch. As people who know me are probably all too aware, this subject is very close to my heart, I’m very happy to chew anyone/everyone I meet’s ear off about my own cafe dreams! So, as soon as I got home I googled Lantana and found the blog in question. I started from the very beginning and read every post until I was up to the present day – it had me hooked! This, along with inspiration from reading Gary Vaynerchuks book ‘Crush It’ was what made me start this very blog. I think I must have been looking a bit lost because I was trying to decide whether to sit outside in the sun or inside where I’d feel more of the atmosphere of the place. But I was soon approached by a lovely friendly waitress who sat me at a vast varnished plywood bench at the front of the very shop, where the window was wide open, looking out onto the street so I got the best of both worlds – perfect! To top it off I had a selection of every weekend magazine/newspaper available laid out right in front of me. 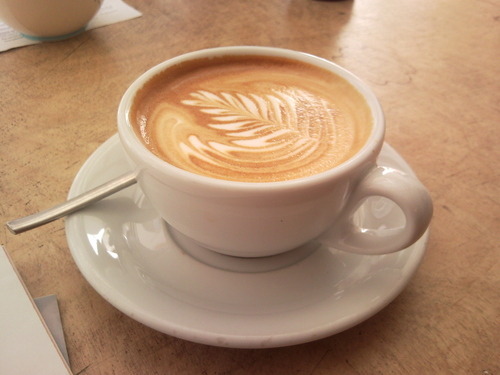 the coffee was nothing short of dreamy. It was smooth, creamy, not to mention a work of art. The menu was a nightmare though because I wanted EVERYTHING on it! 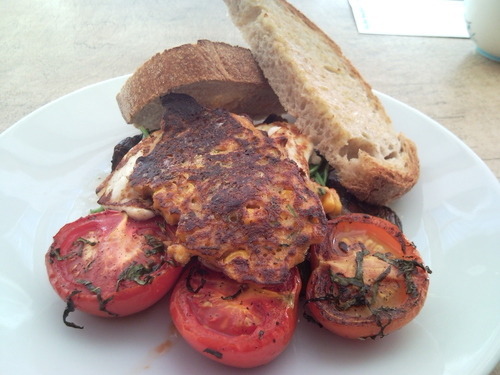 I finally settled for a ‘grilled haloumi stack, mushrooms with herb pesto, corn fritter, sautéed spinach, and roast tomatoes served with wholemeal sourdough toast’ and was assured by the waitress that I’d made the right choice. Every single element of the dish was delicious and the only criticism I have is that I had to add a bit of salt to the sweetcorn fritter, which wasn’t the end of the world! After devouring my brunch and all of the weekend papers, I was toying with ordering another coffee but decided that that would be a little bit excessive and anyway the cafe was really busy, with people queueing for tables. I took pity on a lady who obviously had her eye on my window seat and eventually dragged myself away, stopping by on the way out to tell the owner how much I had enjoyed it! Great work Shelagh! There is no doubt in my mind that I’ll be back!